Virtual reality is the next big thing in home entertainment. While the world’s tech giants obsessed over 3D, attempting one last time to make it mainstream after failed attempts in the late ’80s and ’90s, innovators the world over teased with the prospect of bringing VR back into the mainstream. So what does a future with VR mean for casino gaming, and is it time for you to invest? As 3D went the way of the Dodo – again – VR stepped up to the mantle and has already established itself as one of the must-have pieces of tech in 2017 and beyond. There’s no doubting that virtual reality is here to stay, with every major technology manufacturer from Sony to Samsung and even HTC jumping on the bandwagon. Virtual reality casinos: Is it real yet? Casino VR Poker is one of the first fully realised virtual reality casino gaming experiences. Virtual reality is making the slow transition into the online casino space. 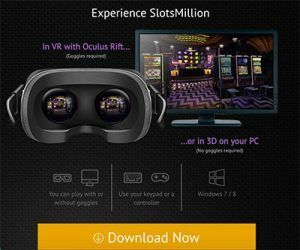 Slots Million currently has a wide selection of VR-compatible online pokies, seeing gaming technology move beyond the desktop and mobile platforms to a more engaging, first-person experience. There’s been a steady rise in the popularity of 3D casino gaming, inviting players into virtual casino worlds that mimic land-based casinos from Las Vegas. Unsurprisingly, with that rise we saw sudden interest in VR, and now many online casinos are experimenting with the technology. What stands to separate virtual reality casinos from the online casino you’re already used to is that the standard VR headset thrusts you into a virtual world, feeding your senses with a first-person view of a gaming floor. The potential is enough to make even the modest online gamer excited at the prospect: walking the aisles of pokie machines is one thing, but being able to walk up to a virtual table to sit and play with other connected players is a far cry from the standard live dealer games we recognise today. VR casinos still have a long way to go, but there’s no doubting that the change is on the way. The selection as it stands is solid but still very much in that “experimental” phase, as is to be expected with new technology. The interesting thing is that, aside from allowing players to explore and game inside virtual casinos through what seems like a real casino, virtual reality casinos open the floodgates for faster, more engaging and intuitive online gaming offerings. 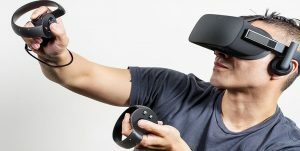 A common line thrown around these days is that the “future is going to be awesome”, and while it may take a while for many of us to finding that comfort zone when putting on a VR headset for the first time, the ways in which it drags you into a virtual world is unparalleled in the current online casino world. What VR casino games are currently available? Slots Million Casino jumped into the VR realm when it launched its virtual reality pokies lounge in October 2015. As it stands and leading into the new year, it’s undoubtedly the safest and most refined VR gaming experience available. Most of the pokies on offer at Slots Million have at least a 3D mode, while those with VR support work with the Oculus Rift headset, one of the first (and probably currently the most reliable) headsets to hit the market. While Slots Million has the best variety when it comes to VR casino games, there are many other third-party games that you can download and play on your VR headset. 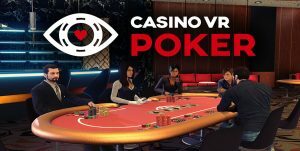 Casino VR Poker is currently one of the most popular pieces of software on the HTC Vive and Oculus Rift. While the lineup is somewhat limited as it stands, additional casino games and slots are constantly being added, as are new casino environments and exclusive character avatars. As you walk around the VR casino (which can also be viewed in 3D without a headset), you’ll be able to see other players walking around who are logged into the same session as you. Gestures and hand movement recognition opens the door for active live dealer games like roulette, blackjack and baccarat VR, while more social features allowing players to chat and engage one another is already being added. Oculus Rift: Undoubtedly the most popular VR headset on the market, the most appealing thing about the Oculus Rift headset is the sheer amount of content available for it, which is constantly growing. It’s also the only device compatible with the Slots Million VR pokies lounge, which makes it a valuable investment. The Oculus Rift really set the standard for the VR industry, being among the first provided to software developers after a successful crowdfunding campaign in 2012. It was eventually purchased by Facebook for more than $2 billion, unsurprising given the sudden rise in the interest in the technology. With an OLED display panel, 1080 X 1200 resolution per eye, 110-degree field of view, and integrated headphones for a 3D effect, for many the Oculus Rift is the one and only option when it comes to VR. 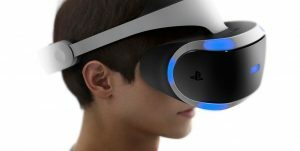 PlayStation VR: Sony’s PlayStation VR headset is the first from a major interactive games creator. Made to work alongside the PlayStation 4, 5.7” OLED screen and 360-degree vision while offering 120 frames per second, making it every gamer’s dream device. As it stands, the software available for it is its biggest downer: while it’s the cheapest VR headset on the market (without factoring in the cost of a PS4), there’s just not all that many great games to play on it. It’s also restrictive in how it can be used, meaning you can’t use it explore the Slots Million pokies lounge, or install Windows-based VR software on it. 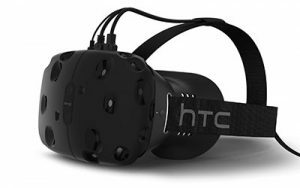 HTC Vive: The HTC Vive promised to redefine mainstream understandings of VR, and in many ways it fulfilled that promised. It allows users to walk freely and explore areas while they connect into a virtual world, using the real world to create virtual environments so as to keep the user safe and not bumping into walls. It offers precision tracking with 32 sensors for 360-degree tracking with 110-degree views, and while many tech-heads claim the HTC Vive is the best VR headset on the market — and it may be — it’s also the most expensive, and also isn’t compatible with online pokies. It’s a more appealing device for PC interactive gamers. Samsung Gear VR: This unique device utilises Samsung Galaxy smartphones and tablets. It straps onto the user’s head to provide an expanded field of view, immersing them in a truly virtual experience. Online pokies aren’t currently compatible with it, but they may be in the future seeing as its most popular games are purchased via the Oculus Store. Virtual Boy: If you want to go full retro, do some Google digging for the Nintendo Virtual Boy. It was the Japanese gaming giant’s attempt at virtual reality 3D game in the ‘90s, and it failed miserably. These days it’s a collector’s item, but its red-neon display made it almost impossible to use and enjoy. We’ve come a long way! Where will VR casinos be in 5 years? Seeing as though VR pokies have grown and evolved so quickly, we should start seeing online casinos like Slots Million and others start offering more gaming variety, probably in the live dealer and table game areas. The idea of putting on a headset and exploring a virtual casino is already well-established, so the natural next step is for these casinos to expand (in the virtual sense, of course), and add more games. More social features, large virtual environments, entertainment offerings, and more are surely in the pipeline. The future’s going to be awesome.